Personal stationery can make a great gift or treat for yourself or a loved one! 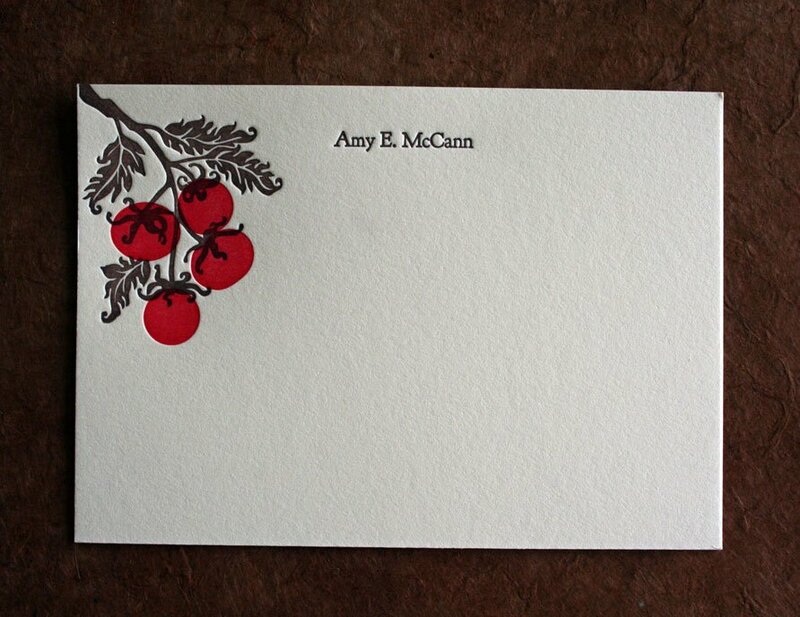 A little while back we printed this lovely set of stationery for long-time client, Amy McCann. You may remember a set of business cards that we created for Amy and her partners at Local Food Marketplace a while back. Amy wanted a set of matching stationery for her to use personally, and this is what we came up with! 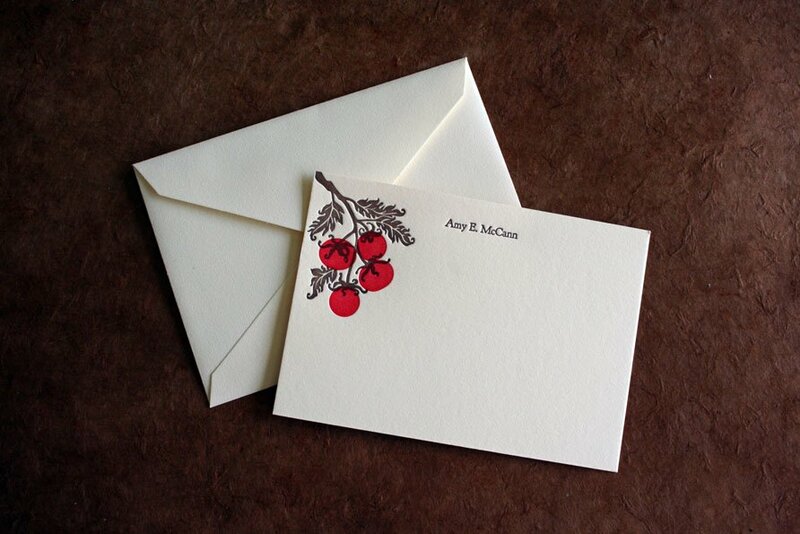 This stationery was printed on 100% cotton ecru paper in two ink colors: red and chocolate brown, and featured Amy’s name and Local Food Marketplace’s tomatoes at the top. We paired them with matching, ecru envelopes that were unprinted. Aren’t they pretty?!? If you’re interested in ordering a set of personal stationery for yourself or a loved one, please don’t hesitate to contact us! We’d love to hear from you! Just because you aren’t getting married, doesn’t mean you can’t have pretty stationery! About six months ago we created a really lovely set of personal stationery for a lady in Newport Beach, California named Laurel. Laurel wanted a set of beautiful cards and envelopes to send her personal correspondence, and I can’t think of a more lovely way to do that than with custom letterpress stationery! 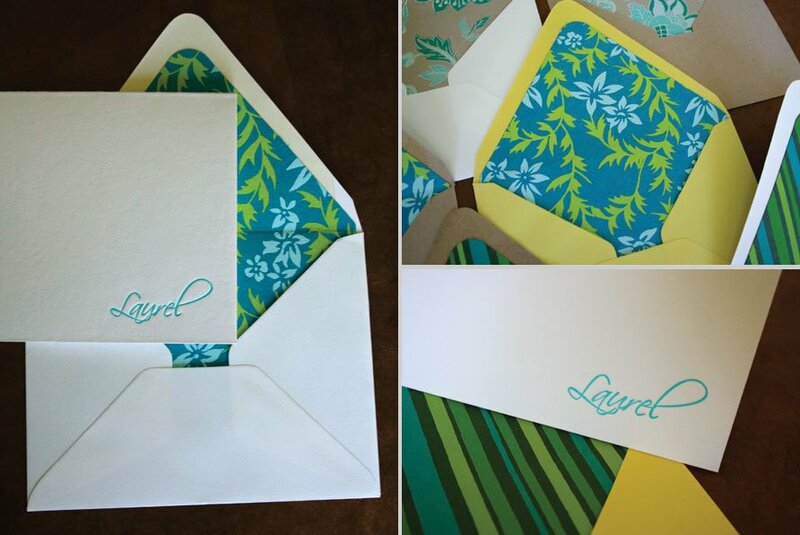 Laurel’s personal stationery is an A2 size flat card with coordinating envelopes. The actual card was fairly simple. It had Laurel’s first name letterpress printed in a lovely, deep turquoise ink in a fun, modern script in the bottom right hand corner of each card. These cards were printed on 100% cotton rag Holyoke Paper. We then paired these stationery cards with an exciting mix of three different colors of envelopes and three different envelope liners. 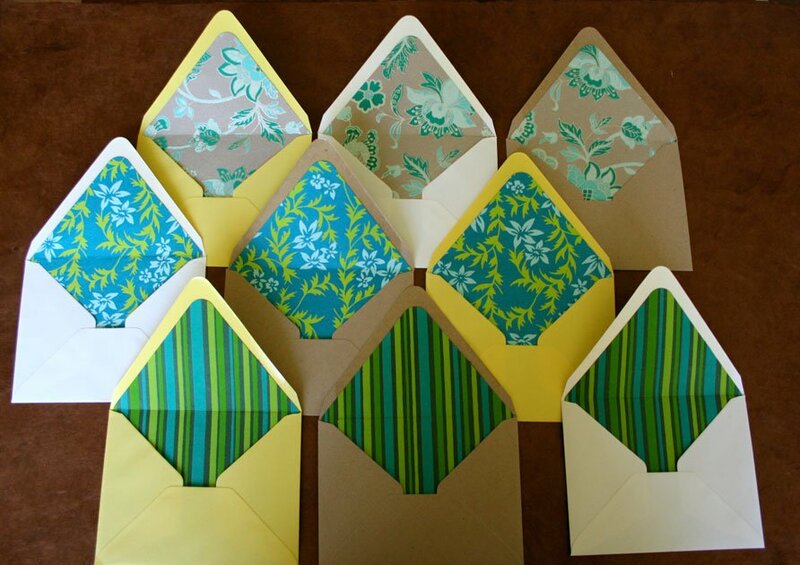 Laurel’s envelopes were a fun mix of European pointed flaps in white, yellow and kraft brown. She then picked out three different, lovely, decorative papers for her envelope liners. Each decorative paper design had at least some turquoise in it, which helped to coordinate them perfectly with the turquoise letterpress printed name on her cards. 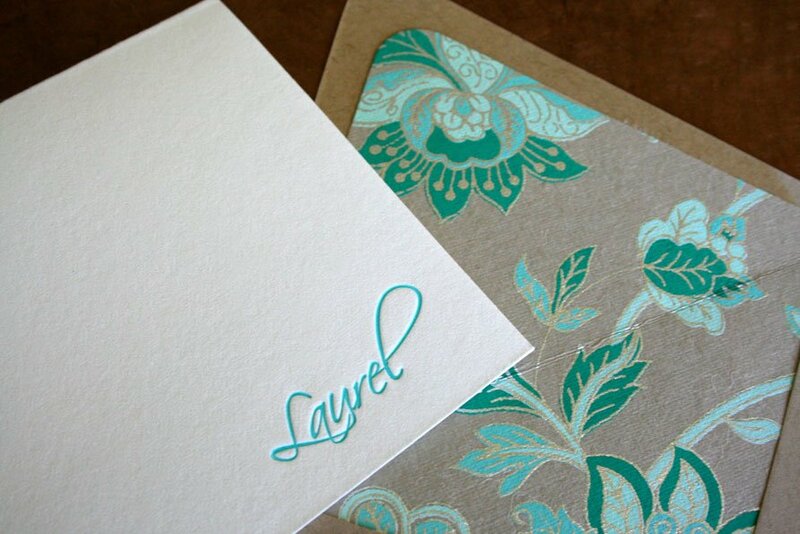 We also printed Laurel’s return address in turquoise on the flap of each envelope. Aren’t all of Laurel’s color and liner combinations so much fun!?! I love how it’s basically like receiving nine different sets of stationery from a single order and design! So many combinations and cool choices! If you’d like to make your personal correspondence more fun with a set of personal stationery of your own, please don’t hesitate to contact us! Thanks so much again for working with us Laurel! If you ever need anything else, just let me know! Check out these lovely letterpress printed calligraphy monogram cards that we printed last week! These cards are a 4bar size folded note card with the couple’s monogram in calligraphy on the front. They were printed on Crane Lettra Bright White paper in black ink, and are blank on the inside. Each of these cards also came with a matching 4bar Crane Lettra envelope with the couples return address printed in calligraphy on the back flap. Both the calligraphy return address and the monogram on the front of the cards was created by the lovely and talented Katrina Centeno of Calligraphy Katrina & Maison du Papier in Los Angeles, California. Calligraphy monogram notecards have been used for centuries for a variety of different occasions, and they are stylish, classic, and timeless all at the same time. Notes like this would be great as thank you cards for a wedding or other special event, and they are also wonderful to use as stylish personal stationery for your ordinary correspondence. I love the contrast of the deep, black letterpress printed calligraphy on the bright white paper. It’s so elegant and timeless! The small, calligraphy return address that we printed on the flaps of each envelope is so beautiful too! You can see it in much better detail in the photo below. Thanks so much Katrina for working with us on these for your client! I just love letterpress printing your calligraphy and can’t wait to work with you again! Talk to you soon! Hello everybody! I hope all of you had a fabulous weekend! Check out this gorgeous set of custom letterpress personal stationery we completed last week for a wonderful couple that we’ve been working with for quite a while now, Kara & Steve. If those names sound familiar to you, it’s because you may have seen their awesome, super-modern Save-the-Dates that we created for them last October here, or their incredible letterpress and laser-cut wedding invitations that we posted this past June, here. Or, maybe you saw Kara’s very cool wedding programs and menus here, in September. At any rate, Kara has been a wonderful, long-term customer that I just love working with, so I was super-excited when she contacted me recently about creating a set of custom stationery with her new last name to use for personal correspondence! In keeping with Kara’s, simple, wonderfully modern style, we created a set of white, 100% cotton, letterpress printed, 4bar size folded notecards, that were printed with just her last name in the bottom center of the card in a fun, funky, typewriter font. The cards were then paired with a variety of four different colors of Waste Not Paper envelopes, all of which had Kara & Steve’s return address printed on the back flaps of them in black ink in the same typewriter font. 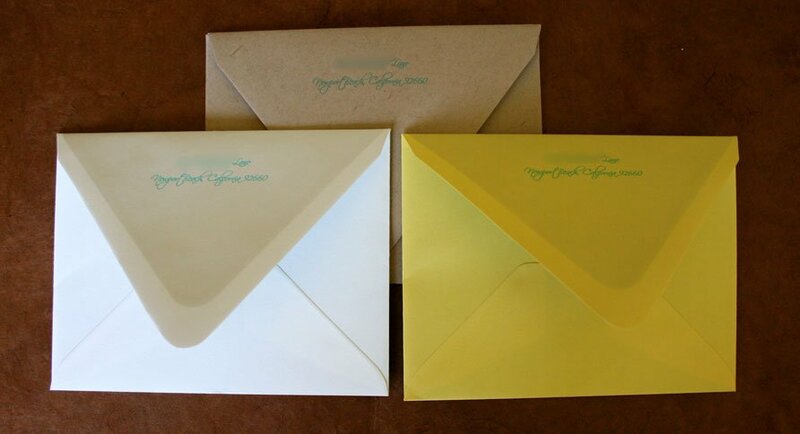 The envelope colors Kara chose were a lovely reddish-orange called “Papaya”, “Gravel” grey, a nice turquoise blue called “Pool” and a bright yellow called “Curry”. 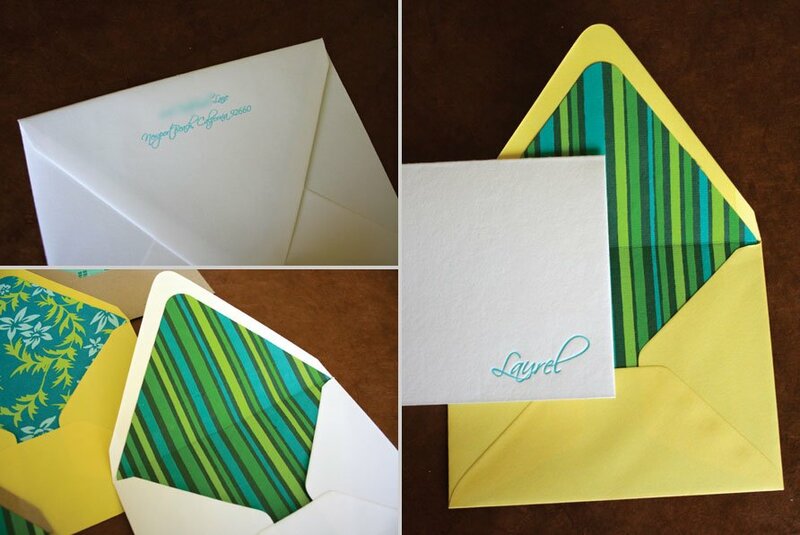 I just love the look of a simple, white card dressed up with bright colored envelopes! Thanks so much again, Kara! You rock!